Mark Bitman, in his NY Times column, hit a nerve with his no-knead bread recipe. 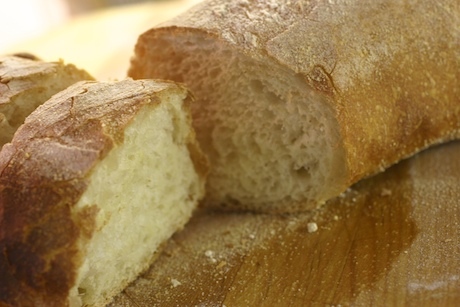 He didn’t invent it, but his article motivated a gazillion people to bake bread. All well and good, but somebody please explain why this is better than kneading. • The time element is the same if you use a pre-ferment like a poolish or a biga. 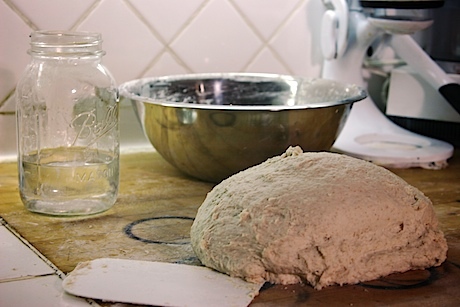 (Make a small batch of bread dough, with some sort of yeast; leave it in the fridge overnight). • You get to work out all aggressions on the dough, it’s a great upper body workout and it only takes 10 minutes. You want to eat the bread, so you need to work out at least a little. • You have the satisfaction of feeling the dough go from a flour ball to a lively, living thing. Quicker satisfaction than gardening. • And you cannot compare the mess element. I’ll clean up after a knead, any day. Take a click and compare the flour factor from an enthusiastic Chez Pim as she sings the praises of the no-knead method. Here is my counter top this morning after kneading. So, somebody, please explain the allure. Eilen: do not fear the knead! Couple of things: the first few times you use the Bertinet method, you will make a mess, including flinging dough on the walls, and possibly the cat at your feet. After that, you figure out the technique and you control the dough. Do not add any extra flour beyond what the recipe calls for, do not add the salt until you have kneaded for about 5 minutes, or until the dough starts to come together. All you are doing is getting air into the dough, and lengthening the glutens. So, you can smack it around, flip it around, but try to fold it over and over so you get air inside. Bertinet uses a two hand stretch and flip method that works great, but I get bored and do a little twist and smack thing that also works. Be inventive. It also helps to take a class so you can get a feel for what the dough should be. Once you get experienced you start to understand that flour is natural and there are variations in every batch of artisinal bread.